Cindy Conner founded Homeplace Earth to help people develop skills to live lightly in this world. She is working to promote local sustainable food systems. Since we all eat, we are all responsible for how the earth is used to produce our food. As a market gardener for 10 years, selling to restaurants, a CSA, and at farmers markets, Cindy recognized that a farmer could be organic and still not be sustainable. Her study of sustainability led her to become certified as an Ecology Action GROW BIOINTENSIVE Sustainable Mini-farming teacher. She also holds a degree in Home Economics Education from Ohio State University and a Certificate in Permaculture Design. Cindy was instrumental in establishing the Sustainable Agriculture program at J. Sargeant Reynolds Community College where she taught from 1999 to 2010. Her time is now spent researching how to sustainably grow a complete diet in a small space and get the food to the table using the least fossil fuel. She is the author of two books published by New Society Publishers: Grow a Sustainable Diet was released in February, 2014 and Seed Libraries was released in February, 2015. Cindy's most recent work is with fiber,particularly cotton and flax, taking it from the seed to the finished garment. Find more about that work on her blog at www.HomeplaceEarth.wordpress.com. Luke Conner, Cindy's son, is a filmmaker with a particular interest in documentaries. Luke filmed and edited both the garden plan and cover crop DVDs. He holds a degree in film from Full Sail Real World Education in Winter Park, Florida. 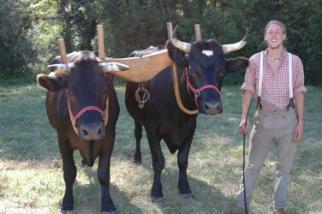 When he is not behind the camera he may be found working his oxen. Luke uses them in films, historical exhibitions, and logging. He is an animal wrangler for animals other than oxen and has worked on the TV shows Revolution (year 1), Sleepy Hollow, and Turn.